We’ve all heard about Wall Street employees who lost their jobs and ended up doing something unrelated, chasing after a dream, starting up a software company, working on a crab boat, teaching English to immigrants, run a taco truck, become a pole dancer…. So the other day, as I was flying home from the East Coast, I sat next to a girl of maybe 20. She raved about her newest thing: a course in sustainable agriculture in Vermont. She lived in New York City, but for six months, she’d be on this training farm, do farm work, and learn the ins and outs of sustainable agriculture. Her dream was to become an urban farmer. She’d rent some rooftop at a commercial building in Brooklyn, have someone install the necessary modifications to accommodate soil, etc., and then she’d plant her seeds. Did she have a farming background? She laughed. She had an Ivy-league degree, worked for a hedge fund for nine years, but wanted to do something else. She probably wasn’t 20 anymore. But it made me think: there should be indices that measure these activities—the number of people undergoing sudden, drastic, and unlikely career changes, voluntary or not—to give us a better gauge of the real economy and the job market. But by the time I got off my last flight at 1 a.m., I’d forgotten about it…. Until, while reading my favorite blogs and websites from around the world, I came across the Vixen Index—Hot Waitress Economic Index is the technical term. During the financial crisis, New York Magazine did a whole story on it. Since it’s apparently a favorite phenomenon in New York, let’s re-baptize it the Empire State Vixen Index. The theory is that in good times, attractive young women have desk jobs or sales jobs or run marketing departments, or write software. But when layoffs ravage their industries, these women become available for other jobs, and restaurant managers—hard-hit by plunging receipts—fall all over each other to hire the best-looking babes in order to attract more customers. “The hotter the waitresses, the weaker the economy,” the article said. Ever the thorough blogger, I Googled a bit further. And the first thing I noticed was unabashed irony, not about the index, which Investopedia took seriously somehow, but about internet advertising. 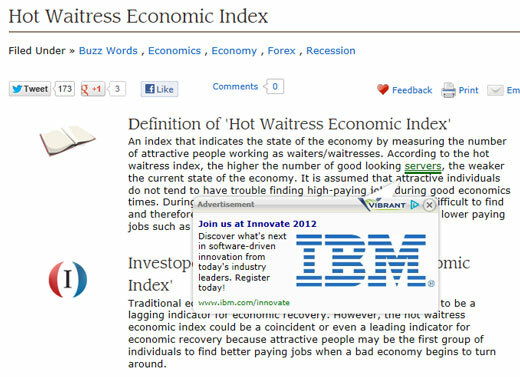 The text defined the index by using the politically correct phrase, “good looking servers.” The word servers being a text link, I hovered over it… an IBM ad! 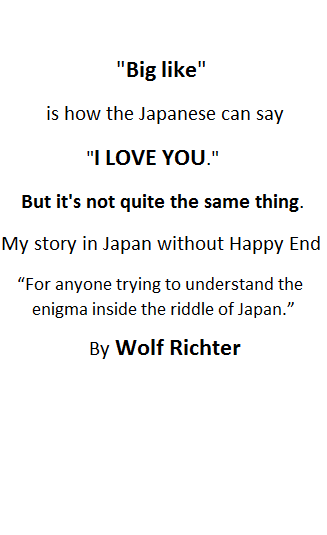 I’d run into this before with an article I’d posted about perceived nuclear contamination of Japan. It had a sushi ad from Google next to the post. Come to think of it, that would be another index: ironic, funny, or cynical ad-and-content combinations, perhaps showing rising or falling levels of Google ad-server desperation. Hmmm. Back to the Empire State Vixen Index. It doesn’t actually exist. Not in the sense that someone like the NY Fed measures the number of hot waitresses and publishes a market-moving graph once a month that the talking heads on CNBC then vivisect. And most people would prefer competent, friendly wait staff with a good idea about the things on the menu. So, if this index measures anything, it might be attitudes by restaurant management, or their efforts to convert their eateries into me-too Hooters. But what if GDP is a similarly twisted contrivance? It does measure private-sector and government spending and investment but doesn’t take into account where the money is coming from. As it completely ignores debt, it creates the farcical impression that ever more debt is desirable because spending, and thus GDP, goes up—ad infinitum. And it doesn’t take into account, well, happiness, as Fed Chairman Ben Bernanke suddenly discovered last week—he who’d dumped trillions of dollars on the Fed’s cronies to make them happy. ← Is The Greek Calamity Economy Headed For Revolt?